Save 20% at the WiFi Boutique Hotel Hong Kong when you book at least 21 days before arrival. After applying the discount, rates start from HKD704 (USD90) for a Superior Room or HKD784 (USD101) for an Executive Room. Rates include free internet access. A 10% service charge is additional. Advance purchase discounts are available through December 31, 2012. Room rates vary by date and will be higher during peak times. Rates are based on single or double occupancy. Triple Rooms are available from HKD1,104 (USD141) per night. Advance purchase rates require pre-payment by credit card and no cancellations are permitted. 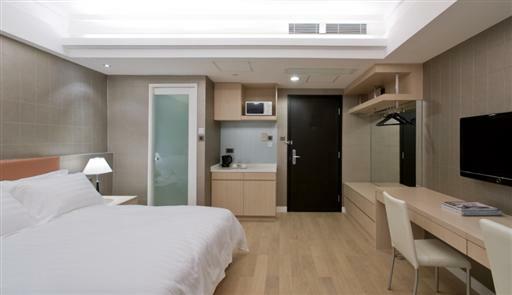 The WiFi Hotel is an affordable boutique hotel located in the heart of Hong Kong’s Wan Chai district. The hotel offers 30 guestrooms with a modern style and amenities including LCD TV with international channels, DVD player, fully-stocked mini-bar, iPod dock, and broadband internet access. The hotel is conveniently located near shopping malls, restaurants, and public transit. The WiFi Hotel can be contacted by calling (852) 3961 2288 or emailing mail@wifihotel.com.hk.